FORT BONIFACIO, Metro Manila- The10th Infantry “Agila” Division has a new commander in the person of Brig. 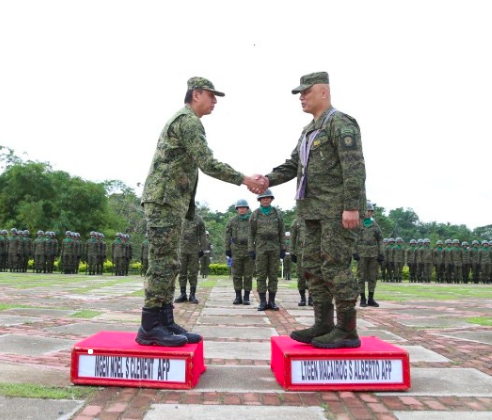 Gen. Jose C. Faustino Jr. who succeeded Maj. Gen. Noel S. Clement in a simple Change of Command Ceremony presided by the Commanding General Philippine Army, Lt. Gen. Macairog S. Alberto at Camp General Manuel T. Yan Sr. Brgy. Tuboran, Mawab, Compostela Valley on Saturday, December 22, 2018. One of the highlights of the ceremony is the ceremonial handover of the Command symbol presided by the CGPA. It is one of the noble military traditions that represent the formal transfer of authority and responsibility from the out-going Commander, Maj. Gen. Clement who also just recently assumed as Commander of Central Command (CENTCOM) in Visayas Region to the in-coming, Brig.Gen Faustino Jr.
Brig.Gen. Faustino Jr., is a member of the Philippine Military Academy “Maringal” Class of 1988. He is a well-rounded officer, full of competence and capable to stir the 10ID into a greater height. He held various key-positions in the field of intelligence, operations, and training. Significantly, he served as the Commander of 501st Infantry “Valiant” Brigade in Sulu, Commandant of the Philippine Military Academy and shortly, as Chief of Staff of the Philippine Army prior to his new post. Lt. Gen. Alberto for his part expressed his profound gratitude to Maj. Gen. Noel S. Clement for leading the unit with excellence, adaptive to organizational change and supportive to the Army’s Transformation Roadmap. He also urged the personnel of 10ID to extend the same cooperation and team work to their new commander. He is very optimistic that Brig. Gen. Faustino Jr. will not just sustain what his predecessor had started but will introduce more innovative measures to attain the desired organizational goals and objectives.